This classic Fresh pastry get’s a holiday makeover with dried fruit and nuts with a drizzle of honey baked between each flaky layer! It is part of the human condition to seek certainty, and from this certainty to gain a measure of predictable order and safety. However, the only thing ‘certain’ is a constant and inexorable march forward, pushed ever onward by the invisible force that governs our existence as a passive tyrant – time. Of this journey, all that we may, truly, carry with us is an increasingly imperfect record, a record fogged by our human perception, nostalgia, and bias – our memory. Memories, in that regard, are like ghosts, haunting their place of origin, lurking just out of sight, but reminding us of their presence once we trespass within their domain. An aroma, a familiar song, a bit of old silverware, and like echoes from the depths of one’s heart, the memories emerge, ageless silhouettes entombed within the minds of the living. Yet, memories are elusive things, and even in this form life is fleeting. Like scorned lovers, if we ignore them, they will depart, and be forgotten. Since it is season for purposeful ‘memory-making,’ I decided to reach back to some of my own most treasured memories for inspiration in preparing my menu for yet another round of holiday meals. Since so many of them involve gatherings at long dinner tables, and festivities where endless food and drink were the main attractions, this was a natural place to start for me. I’ve written about a lot of the big favorites from my home such as the grain cakes and the baklava, and even about a few small after dinner details such as my grandfather and his penchant for fresh sliced peaches in wine. However, apart from all of that, like the most delicate brush strokes of a painting, or the finer edges of a sculpture, it’s the smaller details that help accentuate a memory – and this recipe is one such detail – Pain au Chocolat. Aside from being a fixture on our holiday dessert tables, it’s also a great wintry sweet for ‘just because.’ While I know I should be recommending these for after dinner, I must admit to indulging a few of them for breakfast with black coffee (gasp!). Now, before I get to the recipe itself, I want to pass along a small bit of advice I happened across a long time ago for when it comes to dealing with puff pastry desserts – and I paraphrase – “The pastry shell itself should be delicious enough to be eaten on its own. If in eating the pastry you’re thinking about getting past the shell to the ‘good stuff,’ you’ve failed.” To accomplish this, I value consistent quality above all else, and so I use Pepperidge Farm® Puff Pastry. To start, I prepare the puff pastry sheets as shown and outlined below. 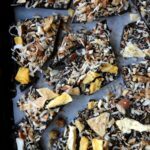 After that, I proceed to chop up the dried fruit – I prefer dried cherries and apricots, since I find these be supremely apropos seasonal flavors, though you could easily use your own favorites as well. To compliment this, I then chop up some walnuts and dark chocolate. Once that’s done, line the pastry with the walnuts and the dried fruit, and fill one end of the pastry with the dark chocolate as shown and described below. Then gently roll the pastries up as show below, and bake. Preheat Oven 350 degrees F. and line a baking sheet with parchment paper. In a medium sized bowl combine the chopped cherries, crushed graham crackers, chopped walnuts, chopped dried apricots and the ground cinnamon and toss. Set the chopped chocolate in its own small bowl. 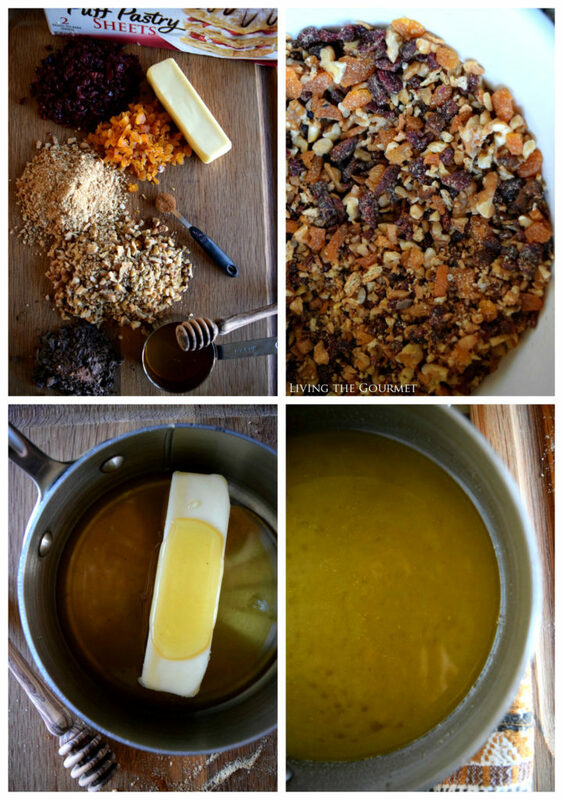 Combine the butter and the honey in a small saucepan and melt on a gentle heat. On a well-floured surface roll out each sheet of pastry dough into about a 10-inch square. Using a sharp knife or pizza cutter, cut the dough right down the middle horizontally and brush the doughs with the melted honey butter. Place 2 teaspoons of chocolate at the edge of each strip of dough. Sprinkle the dried fruit and nut mixture over the rest of the dough. Starting on the side of the chocolate, gently roll the dough to enclose. Place the pastries on the prepared baking sheet and brush each with the honey butter. Bake for 15 -18 minutes or until the pastries are puffed and golden. Remove and transfer to a cooling rack. Once cooled, gently dust each with powdered sugar before serving. For more puff pastry recipes, head over to Pepperidge Farm®, and be sure to sign up for their newsletter for tips and exclusive monthly offers. Also enter below for a chance to win a $50 gift card for the holidays! 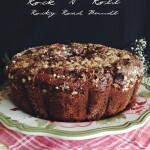 So flaky and delicious...I love that nutty fruity filling! I' love to make the Apple Roses! #InspiredByPuff I've not yet used puff pastry, and I'm excited to try it! I'd make apple roses or some fruit tarts! The Strawberry Napoleons look rather appetizing. I would whip up the FUDGY BROWNIE TARTLETS! :) Yummy! I love apples, so I would most likely try the apple strudel. I would make the HOLIDAY LEFTOVER HAND PIES. The Berry Crumb Tarts sound and look amazing! yum! I would like to make an apple pie. I would love to make some fruit tarts. defiantly holiday left over hand pies! The Roasted Turkey Pot Pie sounds really good! The Apple Roses are so beautiful. Easy Apple Struedel looks good, too. I would make Spanakopita. I love it. I would love to make the roasted turkey pot pie recipe from the Pepperidge Farm website. I would make Beef Wellington. I've been wanting to make it ever since I saw Gordon Ramsay's version of it. I like the roast turkey pot pie. I love dessert, so I would probably make the Chocolate Sundaes in a Shell. Roasted Turkey pot pie looks delicious i might just have to make us some this holiday season! I would make the turkey-stuffing bundles. I would love to make the Snow Kids in Puff Pastry Shells recipe this holiday season! I would make holiday leftovers hand pies. I would make apple strudel! I would make SAUSAGE & STUFFING CRISS-CROSS PASTRY! I love homemade pot pies, either turkey or chicken are delicious! Thanks. I'd love to make the southern pecan crisps. First, anything resembling a dessert goes really FAST in this house. This recipe is an example of that!! However I'd also love to try the Spinach and Feta Mini-Calzones. I would make some fruit tarts. I so miss chicken pot pie with crusty tops. sigh. so that is what I would like to make. I would love to make the puff pastry christmas trees. I would like to try the holiday leftover hand pies! I would make apricot pinwheels. I would make BASIL-MUSHROOM TARTLETS. I'd make the turkey pot pie - sounds perfect for a cold day! I would love to make the PUFF PASTRY CHRISTMAS TREES #InspiredByPuff! I would make the delish chocolate ravioli! What a neat idea! I'd like to make baked brie in puff pastry! I'd like to try and make those apple roses. I would make a turkey pot pie with my Thanksgiving leftovers. I would love to make the beef wellington. Sounds delicious. The Holiday Leftover Hand Pies look great! I would like to make the NO FUSS FRUIT PIE. id like to try the apricot pinwheels! I would love to make apricot pinwheels. I want to make the White Chocolate Mousse Pastries. They look and sound delicious! Something with mushrooms in cream sauce. So decadent. I want to make the HOLIDAY LEFTOVER HAND PIES! Great idea for leftovers! I would like to make the Philly Cheesesteak Rolls. I want to make apricot pinwheels! I would make the turkey pot pie! Yum! I would like to make the EASY APPLE STRUDEL and the APPLE ROSES. I just love anything with apples in it. I want to make Chicken Pot Pie with Pastry Crust and Ham & Cheese Stromboli. I would like to make Nacho Cheese Bites and the Turkey Pie! My husband says if I win i need to make him eclairs. Thank you kindly for the opportunity and have a wonderful Holiday Season Everyone...Enjoy it! I would use it to top chicken pot pie. I would make Chocolate Ravioli. I would love to make the Spinach Triangles. I would love to make the Vegetable cheese strudel recipe on the website! I think the Apple Roses would be a huge hit! I would make the holiday leftover hand pies! What a great way to use thanksgiving leftovers! 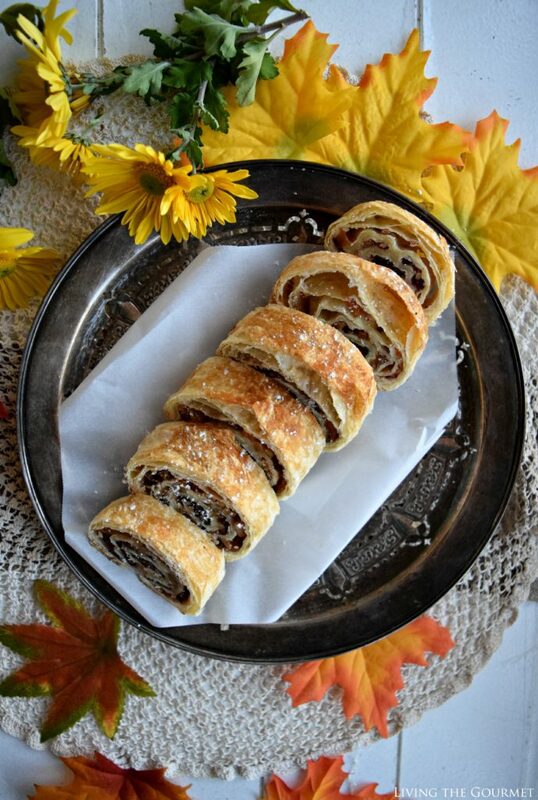 I want to make cinnamon rugelach. i would make homemade baklava!! yum!! I'd make the turkey leftover hand pies. Yum! I would love to make the apple roses, they look so pretty and yummy. I'd make the Mixed Berry Baskets. They look so yummy. I’d like to make the puff pastry Christmas trees. That would be something fun my daughter could help with. The apple roses look so cool lol! The roasted turkey pot pie looks good. I would like to make the Meyer lemon-asparagus galete for my family this holiday season. I would love to try the recipe for the Easy Apple Strudel. I'd love try making some POTATO SALSA SAMOSAS. #InspiredByPuff! I love the APPLE ROSES! I would make Chocolate Rovoli. I'd like to try making Oktoberfest Puffzels. I think I will try the MINI CHEESECAKE CUPS. I am thinking of making cream cheese rolls. I woul make the Roasted Turkey Pot Pie. I want to make the CHOCOLATE PEANUT BUTTER TARTLETS! I would like to make baked brie in puff pastry. I would like to make the apricot pinwheels. I would make the Sausage & Stuffing Criss-Cross Pastry. I would make apple roses. Roasted turkey pot pie sounds SO good! Will definitely be making that! I'd like to make the white chocolate mousse pastries. I'd make turkey hand pies. I would also love to make the Caramelized Onion Tart. I'd love to try the turkey pot pie. I love their suggestions for making hand pies with Thanksgiving leftovers! OKTOBERFEST PUFFZEL or the leftover hand pies. I love those. My hubby on the other hand eats no vegetables so this is a perfect time for me to make them with leftover foods. Thanks for the idea!! The Southern Pecan Crisps sound delicious. #InspiredByPuff! Apple turnovers are first on my list! YUM!! I want to make the MIXED BERRY BASKETS!!! I would like to try to make the APPLE ROSES. #InspiredByPuff! What I would like to try my hand in making with a pastry puff is a beef wellington, just like Gordon Ramsey. I also would not mind trying a home made pot pie. That would be great with all my left overs. There is only my husband and I, therefore, we have so many leftovers. Not only that, his work gives us a big 20 pound turkey for Thanksgiving and it would be nice to do something with all that. #InspiredByPuff! I would love to try a beef wellington, like Gordon Ramsey makes!!!! When I looked at the recipes on the site, I would not mind trying the turkey pot pie. It is only my husband and I and he gets a free turkey from his work it is about 20 pounds, so we have lots of left overs. I want to make the Holiday Leftover Hand pies. I would love to make the apple roses with my daughters. I would make the STRAWBERRY WHITE CHOCOLATE NAPOLEONS recipe. I would make the turkey pot pie! It looks delicious. I would make the roasted turkey pot pie. I would like to try the Chocolate Ravioli recipe. I would make Spinach-Cheese Swirls. I’d also like to try their snow kids in puff pastry shells. I would make the chocolate ravioli. Hmm, maybe the fruit tarts! How great this would be with coffee! I would love to make STRAWBERRY NAPOLEONS! CHocolate and honey and buttery flaky layers? YES PLEASE!!! I would love to try the Holiday Leftovers Hand Pies. I would love to try the berry crumb tarts this holiday season. Baked brie in puff pastry sounds great! I would make the Holiday Brie en Croute. I would like to make the White Pizza Appetizers. I would make Beef Wellington. I would make EASY APPLE STRUDEL! I LOVE the leftover hand pies open there! What a great idea! Your dessert looks so tasty! This time of the year I think I'd use Puff Pastry along with cranberries and cream cheese for a simple tart! I want to make the Apple Roses. I would use it to make apple turnovers for Thanksgiving breakfast. I would also use it to make some palmiers for Christmas! Chocolate Ravioli looks so good! I would also like to make the Vegetable Cheese Strudel. I'd like to make the NACHO CHEESE BITES! Turkey pot pie with puff pastry... to die for! CHOCOLATE RAVIOLI is something I would like to try to make. I would like to try and make the APPLE ROSES. I think the HOLIDAY LEFTOVER HAND PIES look like a great way to use up the left overs. Chow down! Oh I would love to try their TURKEY-STUFFING BUNDLES!!! Oh those look so different and unique! I heard about a recipe that uses pastry cut to fit muffin tins and pour in pumpkin pie filling. I can only imagine what it would taste like with puff pastry! I want to make Baklava. I'M GOING TO MAKE THE CHEDDARY CHICKEN & BROCCOLI IN PASTRY. ROASTED TURKEY POT PIE is something I would make. I would like to make Baklava. I would make the apple strudel for sure! I would make the Turkey & Mushrooms in Pastry Shells. I want to make the CHOCOLATE BUNDLES dessert recipe! Whew! I'd Love A Print Version Of All These Wonderful & Delicious ? Recipes. I'd Be Willing To Buy A Booklet Or Two For Gift ? I would also like to make the White Pizza Appetizers. 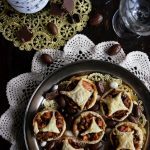 I'd love to make their Holiday Leftover Hand Pies! I'm too lazy to make them but I would like the Holiday Leftover Hand Pies. I would like to make a turkey pot pie with pastry crust. I would like to try and make the FUDGY BROWNIE TARTLETS. This is really beautiful. I live in Martinique, which is a French island, and saw these in the bakery yesterday. Not with fruit or nuts to make them extra special though. I want to try the PUFF PASTRY PIE WITH DILLED HASH BROWNS recipe. I'd make the OKTOBERFEST PUFFZELS. I would love to try the APPLE ROSES. They don't just look awesome I bet they are delicious too. I would like to try making Chocolate Bundles. I would make a turkey pot pie. I want to make Puff Pastry Pie with Dilled Hash Browns. I MAY TRY THE CINNAMON-ALMOND CROISSANTS. Oh I would love to make their APPLE STRUDEL! Oh that looks so yummy! I would make the holiday leftovers hand pies. So many memories involve food, and I love how I can often smell or taste something and have a flood of memories! This recipe looks delicious, and I can definitely see it helping to create some sweet memories. I would love to attempt to make the Roasted Turkey Pot Pie. The turkey stuffing bundles sounds so yummy. I want to make the Chocolate Peanut Butter Tartlets recipe. I would love to serve a baked brie in puff pastry! I would like to try the mini cheesecake cups. I would love to learn how to make BEEF WELLINGTON and some of the desserts. Wondering if the Apple Roses taste as good as they look! I would also like to make the Mushroom and Goat Cheese Tart. Apple Roses is a recipe I want to try. My sweet tooth is calling for me to make the Southern Pecan Crisps!!! They look so delicious! I will definately be making the Roasted Turkey Pot Pie! The POTATO SALSA SAMOSAS sound fantastic! I'd like to try the CREAMY VEGETABLES IN PASTRY SHELLS. I want to make Sausage & Stuffing Criss-Cross Pastry. I would make the Potato Strudel. I would make the BEEF & BROCCOLI STIR-FRY TARTLETS. All I can say is YUM!! What an easy way to have Pain au Chocolate at home! I'd be nibbling on these for breakfast, too! I would make roasted turkey pot pie! The leftover handpies are great. THE WHITE CHOCOLATE CRANBERRY PEAR PASTRY LOOKS GREAT! I would love to try their featured recipe for the APRICOT PINWHEELS! Those sound really good! I love apricots, but do not cook with them very often. Have to try these! The CHICKEN POT PIE WITH PASTRY CRUST sounds good! I love to make the ham and cheese Stromboli because the grandkids would love these. The recipe for Apple Roses looks good too. The Roasted Turkey Pot Pie looks great! I would like to make the Sausage & Stuffing Criss-Cross Pastry. i will be making CHOCOLATE RAVIOLI. its such a yummy dish and i'm a big chocolate fan. I would make the Individual Veggie Pizzas. I would make the Creamy Vegetables in Pastry Shells. I would like to make a homemade Turkey Pot Pie. I would love to make the Apple Rose. They look delicious. THE WHITE PIZZA APPETIZERS LOOK YUMMY! I want to make Apple Pecan Pastries. The featured recipe looks sooo good. I think I'm going to try to make it! I would make the Apple Strudel! Apricot Pinwheels would be fun to try. I'd make MUSHROOM & BACON TRIANGLES. My grandkids would love the Mexican Pizza. The BRIE EN CROUTE sounds great to me! I would love to make the Apple Roses! They look delicious! 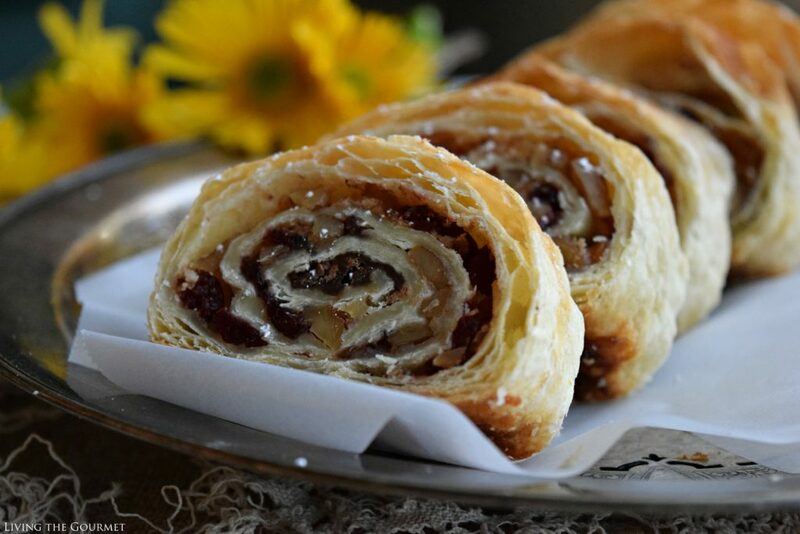 The APRICOT PINWHEELS look delicious. I would love to make those. I would make cinnamon apple tarts. I'm #InspiredByPuff! I'd love to try OKTOBERFEST PUFFZELS! I would like to try the HERBED CHICKEN IN PASTRY. I'd make the CHOCOLATE PEANUT BUTTER TARTLETS. I would like to try the White Chocolate Mousse Pastries. I would make the Savory Herb-Crusted Turkey Pot Pie. I would make The Turkey Pot Pie! The apricot pinwheels look tasty. I want to try vegetable cheese strudel. I would love to make the CHICKEN DIJON IN PASTRY SHELLS recipe. The Savory Sweet Potato Turnover sounds yummy. I would make cranberry hand pies. I would like to try the leftover hand pies!! I like the roasted turkey pot pie. I would love to make the Roasted Vegetable Strudel with Red Pepper Coulis recipe. 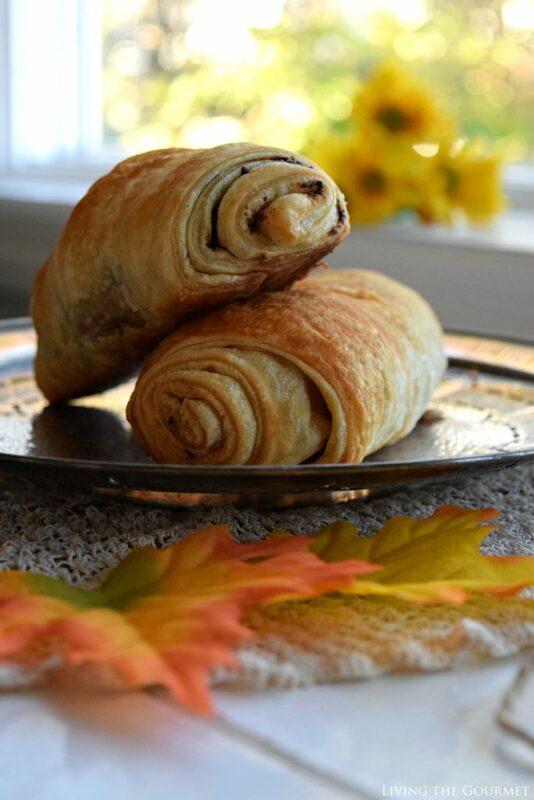 I would like to try Apricot Pinwheel recipe for Thanksgiving dessert. I would like to make the APPLE STRUDEL. A quick granny smith & brie tart. I'd make the roasted turkey pot pie--it looks delicious! I would love to make the BRIE EN CROUTE! I would make the Mushroom & Bacon Triangles. mmm Roasted Turkey Pot Pie. Oh I would love to make their CITRUS FRUIT TART for an appetizer! That really looks good! I want to make Easy Apple Strudel. I would love to try the RED POTATO-CORNED BEEF HASH AND EGGS IN PUFF PASTRY SHELLS recipe. The Citrus Fruit Tart sounds great for brunch. I want to make the brie en croute! I'd love to make a turkey pot pie but I'd tweak the recipe and use different veggies. I’d also like to make the Boston cream puffs. They look so delicious! I would like to try the BRIE EN CROUTE. I would love to make the SCRAMBLED EGG BRUNCH SHELLS. I would also like to make the TURKEY-STUFFING BUNDLES. I would try the turkey pot pie. My family would love it. Vegetable Cheese Strudel looks so good! I would make the Roasted Winter Vegetable Ragoût in Pastry Shells. i would like to make the Strawberry Napoleons for dessert sometime. The Chocolate Crescent Wraps look good. I want scrambled egg and ham napoleans. I WANT TO TRY THE TURKEY-STUFFING BUNDLES. I want to make Chicken Dijon in Pastry Shells. Oh I would love to try to make their BERRY CRUMB TARTS! Those look so good and easy to make! It's been a while but I would like to make Spanikopita. I would like to make the Scrambled Egg Brunch Shells. I want to make brie en croute! CHOCOLATE RAVIOLI is something I want to make! I would like to make EASY APPLE STRUDEL. I would like to make the TOMATO HERB WHITE PIZZA. Roasted Turkey Pot Pie looks good! I would love to make BASIL-MUSHROOM TARTLETS. I would make SPINACH-CHEESE SWIRLS as an appetizer one night. I would like to make puff pastry pepperoni pizza. I would make the Meyer Lemon-Asparagus Galette. I would also make the VEGETABLE CHEESE STRUDEL. I want to make Mini Pull-Apart Pepperoni Bread. I'll make turkey stuffing bundles. The Apple Roses look so good. I'm not sure I can make them but I can try. I would like to try the Franks Under Wraps recipe for the grandkids. The Sausage Bites sound yummy and easy as well. I WOULD MAKE THE VEGETABLE CHEESE STRUDEL. Brie en croute is so delicious and I can't wait to make it! I would like to make the Roasted Turkey Pot Pie. I would like to make the Apple Roses. I’d love to make the Apple Roses! They are so pretty and sound so good. I would make cherry hand pies with the puff pastry!! I would try white pizza appetizers. Southern Pecan Crisps looks delicious! I like the berry crumb tarts. They will be a great hit! I want to make Gorgonzola & Walnut Napoleon Bites. I would make guava pastries. I would make the Franks Under Wraps. I would love to try the ROASTED VEGETABLE PESTO TART. I would make the Southern Pecan Crisp. I'd make the PUFF PASTRY PIE WITH DILLED HASH BROWNS. I would make the HOLIDAY LEFTOVER HAND PIES! I would love to make the Fruit Pizza Puffs. Brie en croute is totally delish! I would try the Mushroom & Bacon Triangles. I would like to make the BRIE EN CROUTE. I would like to make a turkey pot pie! The Oktoberfest Puffzels look delicious! I would make PUFF PASTRY PEPPERONI PIZZA. I would like to try ham and cheese stromboli. I want to make Brunch Ham Puffs. 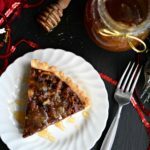 The Farmer's Breakfast Tart sounds wonderful for Christmas brunch. The turkey pot pie sounds yummy. I would like to try that. I would like to make the FUDGY BROWNIE TARTLETS! 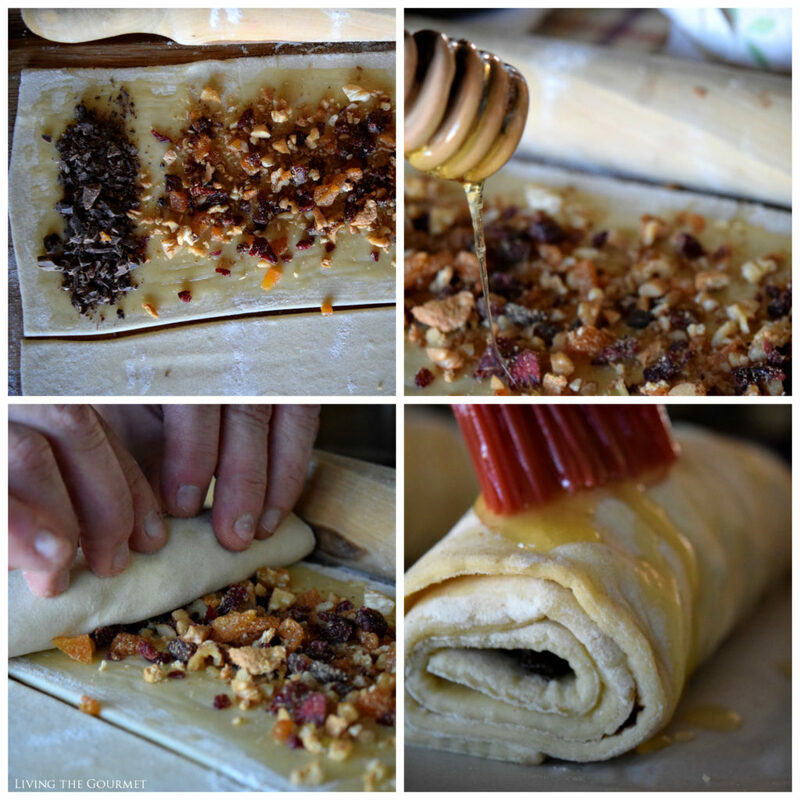 Easy Apple Strudel would be fun to try. I would make the Red Potato-Corned Beef Hash and Eggs in Puff Pastry Shells. I would make some cherry and blueberry fruit tarts. I like the New Year's Sausage & Stuffing Criss Cross pastry. I'd make the MIXED BERRY BASKETS. THE PHILLY CHEESESTEAK ROLLS LOOK GOOD. I would love to make the CRAB APPETIZER NAPOLEONS. I'd like to make the turkey stuffing bundles for my family. I would like to make the roaster turkey pot pie. I would like to try to make the Mushroom and Goat Cheese Tart. I would like to make the Southern Pecan Crisps! I would like to make the SPINACH-CHEESE SWIRLS . I would make apple turnovers or apple strudel. I would like to get #InspiredByPuff by making the Fruit Pizza Puff recipe. I’d make apple roses they look great! I would like to make the Roasted Turkey pot pie with my leftover Turkey. I'd make MUSHROOM, BROCCOLI & CHEDDAR BUNDLES. I would make the Fudgy Brownie Tartlets. I would like to try Berry Crumb Tarts. I want to make Sausage Bites. I would love to try the Tomato Herb White Pizza with my kids! Sounds delicious! Chicken Wellington looks so elegant. Perfect for Christmas lunch. I want to make the Apricot Pinwheels. I would make the Citrus Fruit Tart recipe. The roasted turkey pot pie sounds delicious. I would make southern pecan crisps or the apple strudel. I’d make apple roses or some fruit tarts. i am all about the basil mushroom tartlets! I would like to try the Rocky Road Napoleons dessert recipe. I would make the Chocolate Peanut Butter Tartlets. I would make the CHICKEN POT PIE WITH PASTRY CRUST. I WANT TO MAKE THE SNOW KIDS IN PUFF PASTRY SHELLS. I would love to try the Scrambled Egg Brunch Shells. I would like to try the SCRAMBLED EGG BRUNCH SHELLS. I want to make Potato Strudel. I'd make PUFF PASTRY PIE WITH DILLED HASH BROWNS. Wow. The Roasted Vegetable Pesto Tart sounds absolutely fabulous. Would love to make this. I want to make the Turkey Roasted Pot Pie! 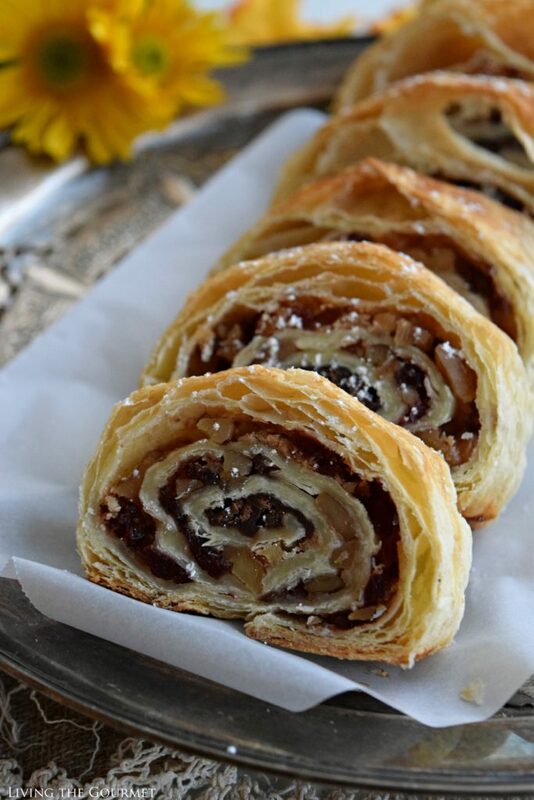 The Easy Apple Strudel sounds good. Crunchy Cinnamon Raisin Buns would be great for brunch! I would like to make the POTATO SALSA SAMOSAS. I would make the Scrambled Egg & Ham Napoleons. I'd also like to make FRANKS UNDER WRAPS. THE CRUNCHY CINNAMON RAISIN BUNS LOOK YUMMY! Mixed berry baskets sound yummy. I want to make Creamy Vegetables in Pastry Shells. I would love to try the APPLE ROSES recipe. I'd make Pesto Elephant Ears. I would like to make the Spinach Cheese Swirls. Perfect for Christmas brunch. I would love to make the HAM & CHEESE STROMBOLI! Ham and Cheese Stromboli would be great for a weekend lunch. I would like to make the Nacho Cheese Bites. I want to make the Baklava. I would love to make the Apple Strudel. I would make the Crab Appetizer Napoleons. I would make their Frank's Under Wraps recipe. I am going to make hot dogs in cresant rolls. THE APPLE STRUDEL LOOKS DELICIOUS! The apple strudel is my fave so I'd try that! I will make the BAKLAVA this holiday season. Making me hungry! Bacon, egg, and cheese pastry shells look great. I would also like to make the Mushroom, Broccoli & Cheddar Bundles. mmm I'd love to make the LEMON MERINGUE TARTS. I want to make Sweet and Savory Paninis. I would love to make the Apple Roses, but they look a little difficult. I would love to make the Apple Roses. So pretty! I would like to make the HONEY-MUSTARD CHICKEN SALAD NAPOLEONS! I'd like to try the POTATO STRUDEL . I would make the Rocky Road Napoleons. I would make crescent rolls. I would like to get #InspiredByPuff by making the TURKEY-STUFFING BUNDLES recipe. I'd make CHEDDARY CHICKEN & BROCCOLI IN PASTRY. I have always wanted to try a chicken pot pie. I would love to try this with Pepperidge Farms Puff Pastry. OKTOBERFEST PUFFZELS look so good! Sausage bites look like a crowd pleaser. I will make a strawberry rhubarb pie. Today I want to make the CRAB APPETIZER NAPOLEONS. I want to make Peanut Butter Chocolate Puff Cookies. THE STUFFED-CRUST SOPRESSATA PIZZA WITH LEMONY ARUGULA SALAD LOOKS REALLY GOOD! I would like to make the HOLIDAY BRIE EN CROUTE. The grandchildren would love the Crisp Pastry Waffles and I would love to make them for Christmas morning. 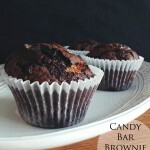 I want to make the FUDGY BROWNIE TARTLETS! I use Puff Pastry to make raspberry turnovers. Sometimes I add chocolate and whip cream. I would love to make the Mexican Pizza. I want to make Turkey Stuffing Bundles. I would make an apple pie. I would like to get #InspiredByPuff by making the PARMESAN PINWHEELS recipe. I would make the Puff Pastry Pie with Dilled Hash Browns. I would love to try the Philly Cheesesteak Rolls. I would make these https://www.puffpastry.com/recipe/franks-under-wraps/. Yes, with kids. Nice idea to spent time during holiday. Apples and pecans.. or a cheesecake filling.. or a handheld cherry pie. Oh I'm hungry now! Chicken pot pie squares looks interesting. I will make the PUFF PASTRY PIE WITH DILLED HASH BROWNS. I LOVE THE PUFF PASTRY CHRISTMAS TREES. SO CUTE! I'd like to make Chicken Dijon in Pastry Shells. I would make homemade baklava! Everything looks delicious, but I would definitely make the holiday leftover hand pies. Ooh the Oktoberfest Puffzels look and sound amazing! Sure to be a huge hit with my kids! I would try the Roaster Turkey Pot Pie. The kids would love the Puff Pastry Pepperoni Pizza. I would like to make the CHOCOLATE CRESCENT WRAPS. I would make turkey pot pie. I would like to get #InspiredByPuff by making NEAPOLITAN ICE CREAM NAPOLEON recipe. I would make the Potato Salsa Samosas. Oh yum....I'd make the CHICKEN DIJON IN PASTRY SHELLS. Holiday Brie en Croute looks delicious! I would love to make the MUSHROOM & BACON TRIANGLES. I'd like to make the Chicken Pot Pie with Pastry Crust. I would like to try white pizza. I WOULD MAKE THE WRAPPED PEARS WITH VANILLA BEAN SAUCE. I would love to make the Wrapped Pears with Vanilla Bean Sauce! The Holiday Brie En Croute look yummy and festive. Would love to make this for a get together. I'd make Balsamic Pear & Cranberry Crisps. I would love to make the APPLE ROSES! I'd love to make brie en route. I would make a pot pie. I would like to get #InspiredByPuff by making the HOLIDAY BRIE EN CROUTE recipe. HOLIDAY BRIE EN CROUTE sounds delicious. The mini cheesecake cups sounds delicious. I would make the MUSHROOM, BROCCOLI & CHEDDAR BUNDLES. I would also love to make the HAM & CHEESE STROMBOLI. THE BAKED MONTE CRISTO SANDWICHES LOOK GOOD. Wrapped pears with vanilla bean sauce sounds yummy. I want to make Candied Walnut-Camembert Puff Tartlets. My husband would LOVE the Philly Cheesesteak Rolls. I want to make ROSEMARY ROMANO RIBBONS! I would make the ROASTED VEGETABLE STRUDEL WITH RED PEPPER COULIS. HOLIDAY BRIE EN CROUTE looks amazing, so I will attempt to make it. 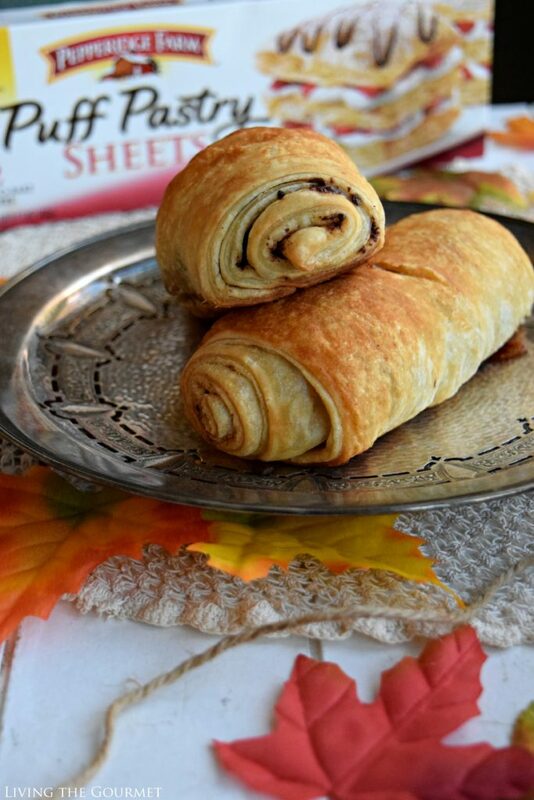 I would like to get #InspiredByPuff by making the HARVEST SPICED ENVELOPES recipe. I would love to make the Fudgy Brownie Tartlets. I would make some berry crumb tarts. PUFF PASTRY CHRISTMAS TREES are very nice! 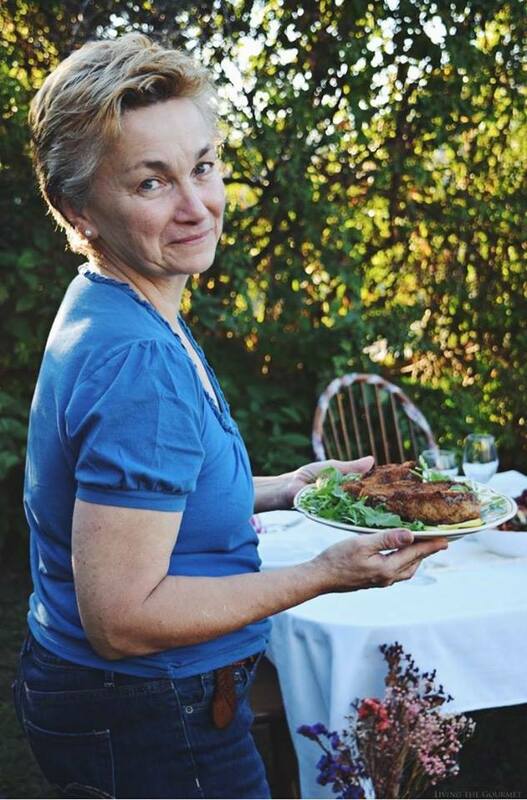 I would make the Herbed Chicken in Pastry. I would make the Harvest Spiced Envelopes. I WOULD DEFINITELY MAKE THE WHITE CHOCOLATE MOUSSE PASTRIES. I would like to try the CRANBERRY GINGER EGGNOG TORTE. I want to make Maple Walnut Cups. I will try to make white chocolate pastries!! Oooooh I would love to make the Southern Pecan Crisps! I would love to make the HOLIDAY BRIE EN CROUTE! PUFF PASTRY CHRISTMAS TREES are cool looking. I would like to try the POTATO SALSA SAMOSAS. I would make the Philly Cheesesteak Rolls.! I would love to make the HOLIDAY BRIE EN CROUTE! It looks so easy and elegant, that I could make that as the center piece of my holiday table! I am definitely trying this one! I would make the Poached Eggs and Ham on Puff Pastry. THE HARVEST SPICED ENVELOPES LOOK YUMMY! I would love to try the Harvest Spiced Envelopes. The Puff Pastry Christmas Trees are cute! the Beef & Broccoli Stir-Fry Tartlets look good. I would like to make the Chicken Dijon in Pastry Shells. The apple strudel looks good. We love apples. I would love to try the Beef and Broccoli Stir-Fry Tartlets. I would love to try the ROSEMARY ROMANO RIBBONS. I would like to try the Savory Sweet Potato Turnovers. I would like to make the MEYER LEMON-ASPARAGUS GALETTE. The Ham & Cheese Stromboli sounds good. I would like to get #InspiredByPuff by making the ROASTED VEGETABLE PESTO TART recipe. I would make some pot pies. Harvest Spiced Wraps would be great for the holidays. I would make the Easy Eggs Benedict. I'd make the PEAR MINI-TURNOVERS. HARVEST SPICED ENVELOPES sound delicious. I would love to make the Southern Pecan Crisps! I CAN'T WAIT TO TRY THE PULL-APART LOAF WITH MAPLE BACON. I want to make Sun-Dried Tomato Quiche Cups. HARVEST SPICED ENVELOPES SOUND YUMMY. Another recipe that I would like to try is the Potato Salsa Samosas. I would make the PB & J Doughnuts. I would like to make the Wrapped Pears with Vanilla Bean Sauce. THE VEGETABLE CHEESE STRUDEL. YUM! I would like to try the Philly Cheesesteak Rolls. I want to make Baked Monte Cristo Sandwiches. I would like to also make the HARVEST SPICED ENVELOPES. I would like to get #InspiredByPuff by making the PHILLY CHEESESTEAK ROLLS recipe. I would make pot pie. I would make the Philly Cheesesteak Rolls. WRAPPED PEARS WITH VANILLA BEAN SAUCE SOUND GOOD TO ME! I"d make SPICY BEEF & BROCCOLI PINWHEELS. The Apple Roses look delicious, but I'd also love to try my hand at baklava. I will be making the Wrapped Pears with Vanilla Bean Sauce. I think the delicious recipe will come out wonderful, and is a gem in my holiday recipe collection. The Ham and Swiss Chicken in Pastry looks good. I would like to make the Roasted Turkey Pot Pie, I love the added sweetness of the cranberries. Poached Eggs and Ham on Puff Pastry looks delicious! Puff Pastry Christmas Trees are adorable. I have to try these. Franks under wraps look festive for a party. I would make the Strawberry Napoleons! I would love to try and make some cheese fruit tarts. I would like to try the Southern Pecan Crisps. I WILL BE MAKING THE APPLE ROSE, THE SOUTHERN PECAN CRISP, AND THE CANDY BAR BROWNIE CUPCAKE WITH BLONDE BROWNIES INSTEAD OF CHOCOLATE.